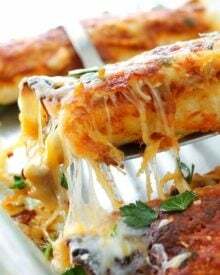 These beef enchiladas are filled with a flavorful beef, bean and chili mixture, covered in a delicious homemade sauce and smothered in gooey cheese! One bite of these beef enchiladas and you’ll be hooked! 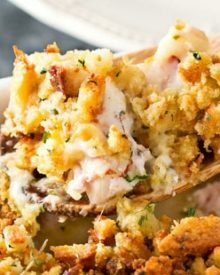 The filling is super flavorful and the homemade sauce really takes it from great to OMG fantastic! Mexican food… ahhhhh Mexican food. I just simply do NOT get tired of eating it! Tacos, nachos, burritos, chimichangas, fajitas, and enchiladas. 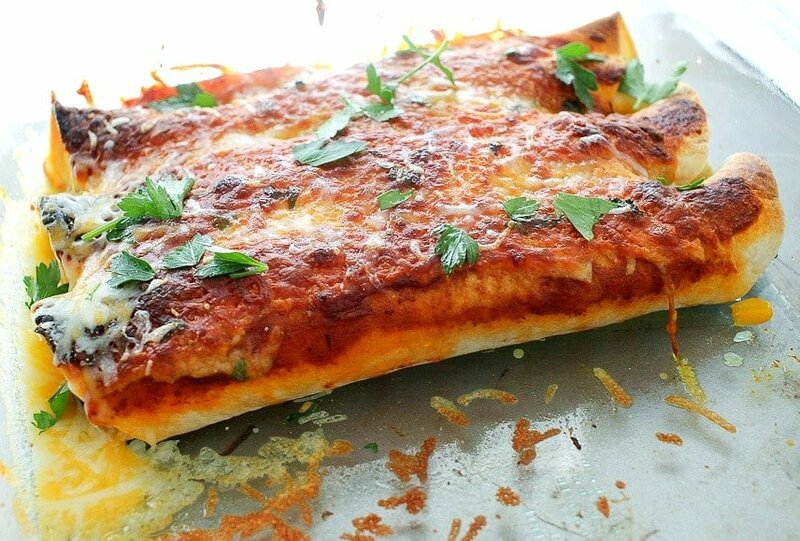 There are so many recipes for enchiladas, but this one is my absolute favorite one. 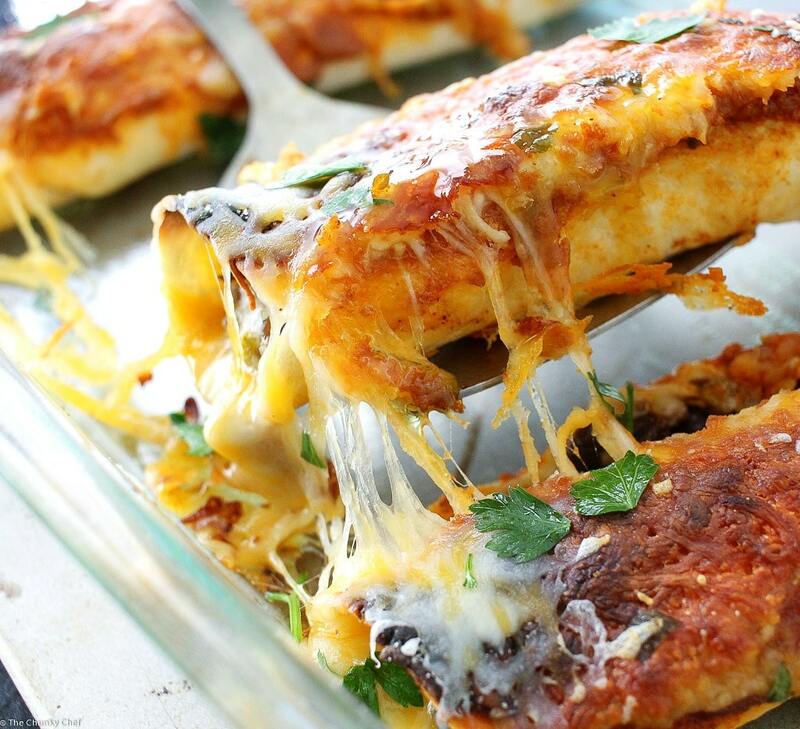 Beef enchiladas with something extra… a homemade enchilada sauce! But HERE is where the recipe came from, and she is awesome! Check it out! Alright, let’s get to the filling! Which do you prefer… chicken or beef? 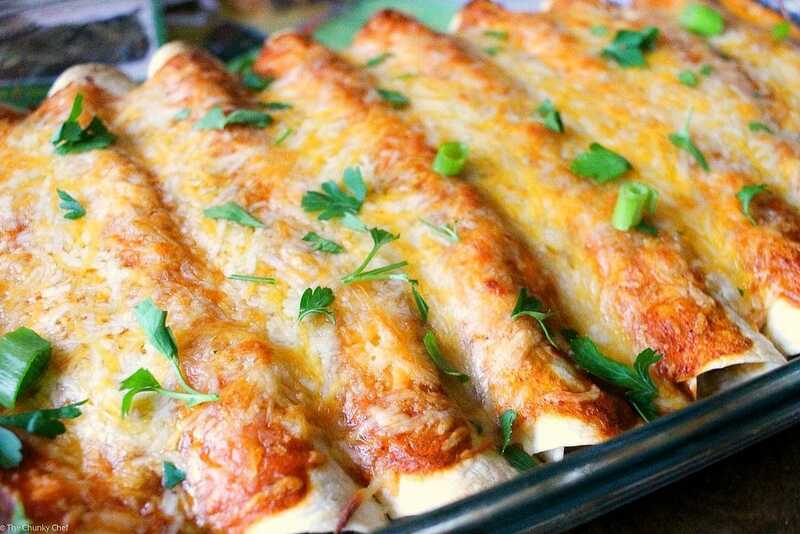 I love them both equally, and what I love about these enchiladas, is that it works perfectly for either chicken or beef! It would also work if you’d prefer a vegetarian bean filling. I used a ground beef with a higher fat ratio for extra flavor, and browned it in my BIG skillet. Once the meat was most of the way browned, I added in my onion, garlic, and green chiles, to saute for a few more minutes. Then drain the meat mixture and set aside. Now just set up an assembly area and add a couple of tablespoons of the enchilada sauce to a flour tortilla, add some black beans down the center, top with ground beef mixture, drizzle with a little more sauce, and top with some shredded cheese. Roll up the tortilla and place in a greased 9×13″ baking pan. Repeat with remaining tortillas, then spread sauce over all the tortillas and cover with shredded cheese. Bake uncovered for about 20 minutes, and broil the last couple of minutes if you want it more of a golden brown. Garnish with some chopped cilantro and green onions, it adds such a great flavor! I like to serve my enchiladas with some sour cream, extra cilantro and green onions, and with some sweet corn on the side. That cheese you guys… O…M…G! So cheesy and gooey! If you're making homemade enchilada sauce, prepare it. Add oil to a big skillet and heat over medium high heat. 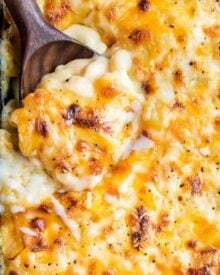 Add ground beef and crumble (use a potato masher to make it easier). 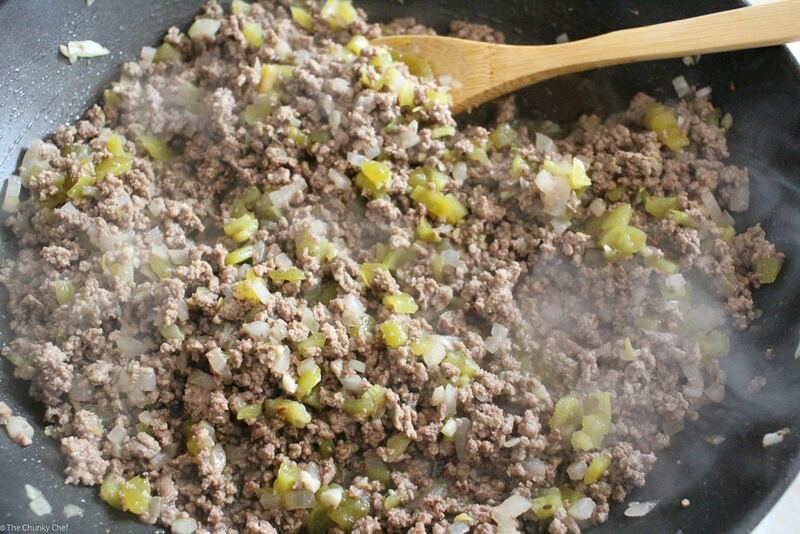 Once ground beef is about halfway cooked, add onion, garlic, and green chiles and saute for 3-6 minutes, stirring occasionally. Drain beef mixture. 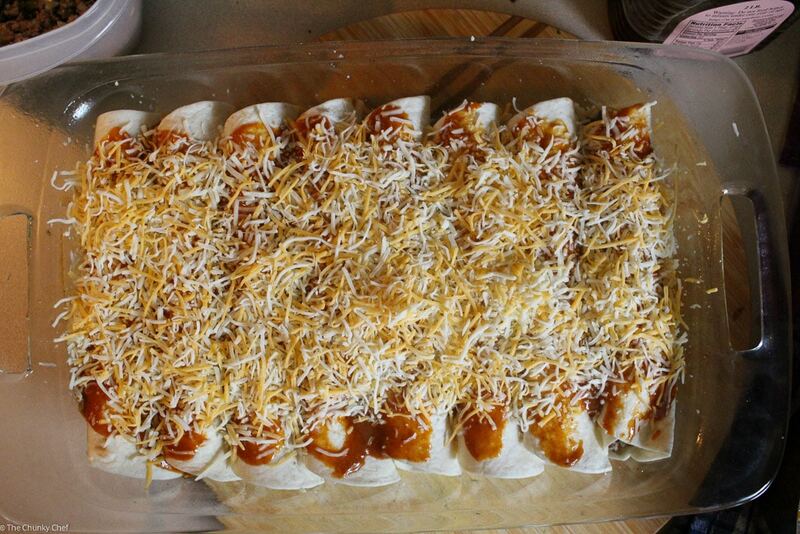 To make the enchiladas, spread a couple of tablespoons of the enchilada sauce over the tortilla. Add beans in a line down the middle of the tortilla, then add in a spoonful of the beef mixture, drizzle some extra enchilada sauce over the meat, then add one third of a cup of cheese. Roll up tortilla and place in a greased 9 x 13" baking pan. Continue with remaining tortillas. Spread the remaining enchilada sauce over the top of the tortillas, and sprinkle with the remaining shredded cheese. Bake uncovered for 20 minutes, broiling the last few minutes if you want the cheese to be a more golden brown. Garnish with chopped cilantro and green onions. 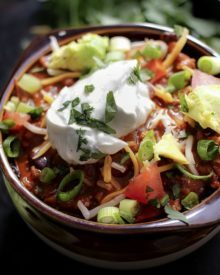 ** you could easily swap out ground turkey, diced chicken, pre-cooked shredded chicken or all beans for the beef in this recipe. 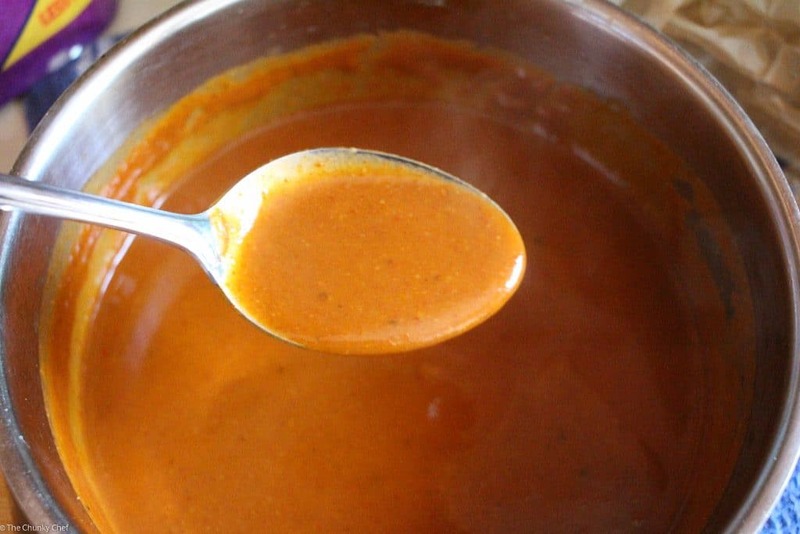 You'll never want store bought enchilada sauce again! Heat oil in a saucepan over medium high heat. Add flour and whisk together over the heat for one minute. Stir in the remaining seasonings (chili powder through cayenne pepper). Then gradually add in the stock, whisking constantly to eliminate lumps. Reduce to low and simmer 10-15 minutes until thickened. Use immediately or refrigerate in an air-tight container for up to two weeks. Absolutely the best recipe by far! My picky Texan husband loves them. These were sooooo gooood!! I used canned enchilada sauce because I’m lazy and it was still amazing. Although I like black beans, I used refried instead as someone else suggested, just cuz I like them better. Worked perfectly. And I will admit, I used far more than 3 cups of cheese, well, because…. CHEESE!! Thanks for the recipe! I’m making this as a freezer meal. Any suggestions on cooking time if it’s frozen ? These were excellent. I made it exactly as written and they came out perfect. I also made home made enchilada sauce (https://www.pinterest.com/pin/331014641356687916/) and together they rocked. I added the black beans to the hamburger mixture along with some mexi corn. My family loved this. I’ve never tried it (we always devour them right away lol), so I can’t say for sure. I absolutely loved this recipe! I even made the enchilada sauce and really enjoyed it! Will definitely be making this again next week! These are the best Enchiladas we’ve ever had. I asked my kids what would you like me to make for dinner tonight and first it was homemade meatballs but then it was quickly changed to “can you please make the homemade enchiladas” of course I said yes ….. this is my fourth time making them ? I make enchiladas with some frequency.. Because we are empty nesters and light eaters, I usually freeze half before baking for the next craving. I also freeze the home made sauce. I’ve been in a chicken, flap steak and even pork rut lately. I came across your recipe and had a “well duh” moment. For some reason I’d never eaten or made enchiladas with ground beef..
My family doesnt like black beans. Can i use refried beans? Hi Elaine 🙂 Yes, that would be a great substitution! Made these tonight for supper. Tasted great. Mine turned out soggy though with a lot of grease on the bottom. I used venison and shredded my own cheese, Any ideas how to prevent this? Hi Leanna 🙂 I’m happy to hear that you loved the taste, but sorry to hear things got greasy. I’ve never had that problem before… so my suggestions would be to drain the beef (or other ground protein) really well, and to maybe use a bit less sauce. It also could have been the venison, as I’ve only made this recipe using beef, chicken and turkey. Hope this helped! I just made the tonight. i never eat enchiladas because the chicken and corn tortilla ones i make are very time consuming and that is with using canned enchilada sauce. I decide to try some ground beef and flour tortilla ones and found this recipe. Boy was it alot easier even with making the homemade enchilada sauce! My whole family loved it and I will be making these again. The only thing I would do different next time is I would double the enchilada sauce mix. My family loved the sauce and was asking for more sauce and I didnt have any left over after making the recipe. I think they were perfect just as is, however I would make extra sauce so they can add more to their taste. 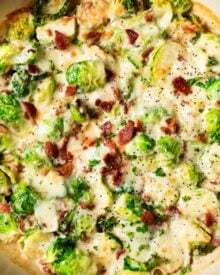 Thank you for sharing this wonderful recipe, I will be returning to your website to try other delicious recipes soon! These were absolutely delicious!! It is very hard to find a dish that my whole family enjoys, but my 3 year old, 6 year old, 9 year old, and husband cleaned their plates. I’m glad I used your homemade enchilada sauce!! Definitely a keeper. Thanks so much for sharing! 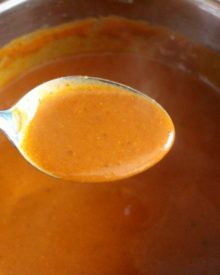 The homemade enchilada sauce is a winner! I intend on using it from now on when making enchiladas! I did have to double the sauce. For the meat part, thought it was bland, so I added a jar of salsa to it to flavor it up some more. Used corn tortillas- the enchiladas were restaurant quality! Thanks for sharing this recipe! Hi Felicia 🙂 I’m so glad you enjoyed the meal and found ways to customize it for you! 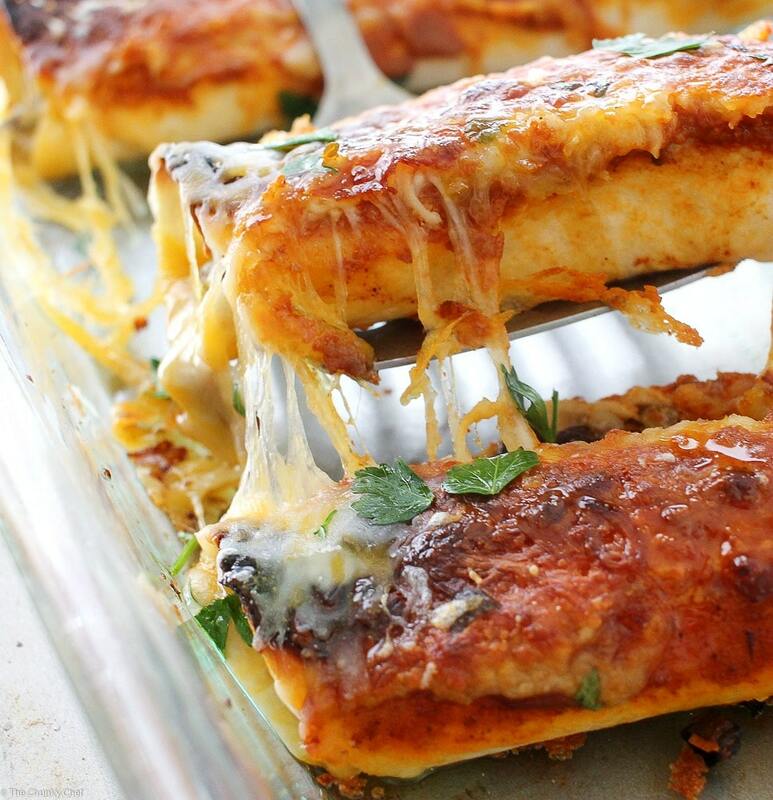 Made these enchiladas tonight…AMAZING! Made the homemade sauce…also AMAZING! Thank you for a great recipe!! 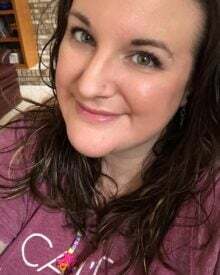 Hi Dawn 🙂 I’m SO SO SO glad to hear that you loved the enchiladas and the sauce!! This recipe looks delicious! They are not enchiladas though! 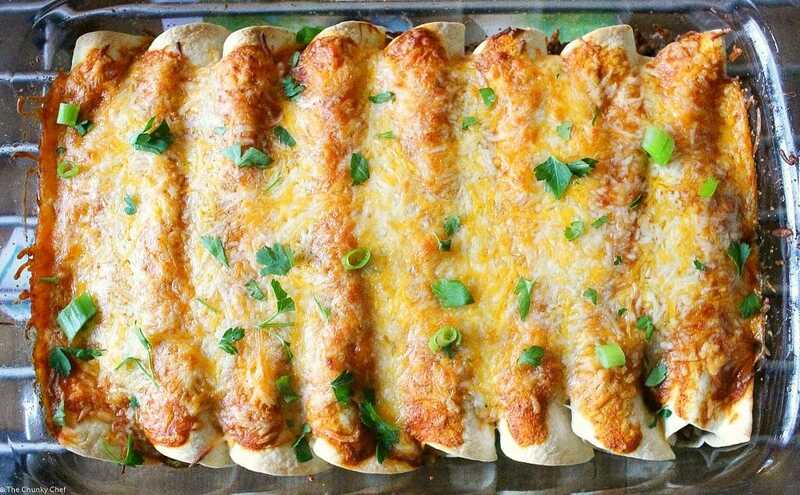 Enchiladas are made with corn tortillas! Hi Mary 🙂 Thank you! I never claimed them to be authentic, which, you are correct, would use corn tortillas 🙂 My family prefers the taste of the flour tortillas, so that’s what I used. Around here, many places offer “enchiladas” with flour tortillas, as a slightly “Americanized” version of the dish. You could certainly use corn tortillas for this if you wanted. Wow, just found this on Pinterest and happened to have everything in my kitchen, they did not disappoint at all!! Hubby loved them!!! Snow is flying and we are in heaven!!! 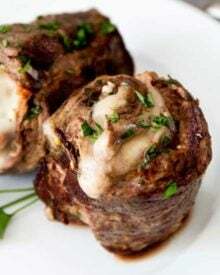 I just found this recipe recently and made these tonight and WOW, my whole family loves them! I’ve struggled to find an enchilada recipe that trumps the Mexican restaurants and this does! Thank you for sharing. I’ve actually never had enchiladas with a tomato-based sauce, only coriander and they were nothing to write home about so I’m really excited to try yours!! These look great! Would they turn out if I prepared them the night before and then poured the sauce on right before I baked them? When I work I like to have meals prepped so when I get home I can just pop them in the oven! Hi Marcy, thank you!! I think that would work well, and is a great way to make dinner time a lot easier 🙂 Let me know how it goes! I did this. I made Saturday night and kept in the fridge. Turned out great! Made the roasted corn and pepper salsa the night before too. Oh wow…the stringy cheese pictures are making me hungry! These look delicious…I am going to try out your recipe with ground turkey. Mexican food is my favorite, especially enchiladas! These are calling my name! Whoa! That cheese is making me swoon! I’m such a sucker for melted cheese! Amanda, are we one and the same?! I LOVE Mexican food. My mom was surprised to hear it was my favourite cuisine (probably because she is picky and I am not.) 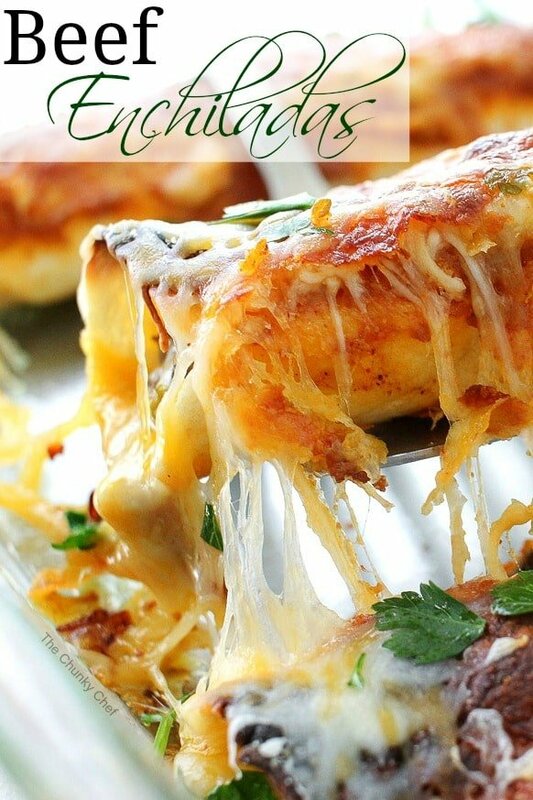 These enchiladas sound awesome and when I make them, I am so doing a veggie version for myself! Oh how I love a good enchilada dish!! These look amazing! I am focused on that ooey-gooey cheese too. I would be gobbling these up. Probably need to make two batches so there is some left for everyone else. I’m trying these tonight, without the chiles because I have none. Your pictures are awesome! I hope they taste just as good ? i stumbled upon this recipe on Pinterest and made it for a fiesta we were going to. People RAVED about it. There was a gentleman there from Mexico who had three helpings and absolutely loved it. Needless to say, this is now our go-to recipe. Wwe were actually requested to make it during our upcoming vacation! I think it’s the homemade enchilada sauce that nailed it. Thank you so much for making me look so good! I know a number of my friends repinned this on their own wall. I’m very wary of Pinterest recipes but this one nailed it! And I failed to mention that the people whose party it was and who requested we make them again are owners/chefs of a restaurant in Center City Philadelphia! They know GREAT food! Keep the recipes coming! Ohhh my that is AWESOME!! Michele, Thank you for a true review! I wish people would refrain from merely saying how great a recipe looks and give it 5 Stars. That’s so not helpful and I don’t want to waste my time reading how GREAT something looks. 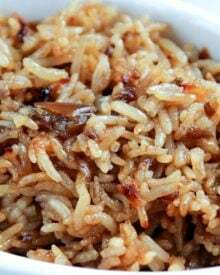 I will try this recipe based on your review. THANK YOU! These look so fabulous! I’m pinning them to my Cinco de Mayo board! Fabulous dinner! I want it now! Thanks for linking up with What’s Cookin’ Wednesday! Hi! the photos look amazing! Do you have any tips and tricks for the perfect fork-pick-up shot? I’m assuming you’re balancing the camera with the other hand? This looks like just the kind of meal I’ve been craving lately! 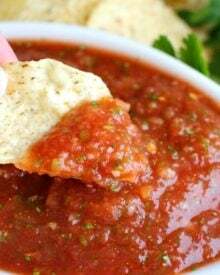 I love that you used homemade enchilada sauce. Wow these look so delicious, thank you for the step-by-step pictures as well! YES. your photos have me drooling. Gosh, this looks incredible! I can’t wait to try this! Thank you muchly for the recipe (and an idea for dinner tonight)! Thank you so much Jerusha!! I’m so excited you’ll be trying it 😀 Let me know how you like it! Enchiladas are always the best! I need to add these to my dinner menu soon! Wow!! I LOVE how these look! I mean, seriously can I just come over for dinner? The pictures look AMAZING!!! That melty cheese… seriously I am just dying over here!! These look awesome! Those gooey cheesey shots *heart eyes* oh my! Mexican food is just the best, it never gets boring and I haven’t tried one I didn’t like yet! I love the Black Beans in your Enchilada’s and your sauce looks awesome! Thanks so much for sharing your Beef Enchiladas with Homemade Sauce with Full Plate Thursday and come back soon! Thank you so much Jhuls!! 😀 Happy FF to you too! Looks delicious, and something I could actually make. Visiting from Over 50 feeling 40! Oh my I am just drooling! I was just reminded that Cinco do mayo is on it’s way. This will be perfect! I think I’ve just found my new favorite set of pictures friend!!!!!! These are AMAZING!!! I believe you when you say how good they are……… dare I make them?!!?! Well I’m pinning for SURE… and who am I kidding, I’ll probably be eating these by the end of the week. I love the IMG flip thingy!!!!! So cool! Yum! You are making me hungry, Amanda. I NEED to have enchiladas!